Need Father's Day Ideas? Ones That Come 25% Off? In the process of hunting for Father's Day gifts I thought of some of the perfect solutions for my husband. Meaning, things he will like that I can use too! What about a mechanical carpenter pencil? 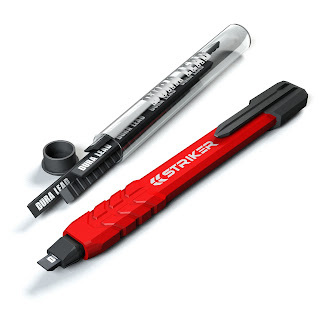 The Striker pencil allows you to make crisp, sharp lines right out of the packaging. 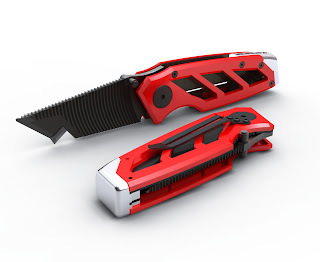 No more sharpeners, utility knives or broken pencils. When more lead is needed, simply press the cap of the pencil. How smart is that? 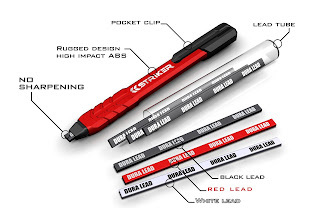 The leads even come in different colors to allow you to make marks on pipes and dark colored surfaces. Genius, and at only $3.49 totally affordable. The Striker Carbide Utility Score allows easy scoring and snapping of Hardie Board, linoleum, plastics, glass, roofing, and laminates (so just about any surface you can think of!). It features a crosscut file on the side of the blade for smoothing out edges without having to pull out a file or rasp. 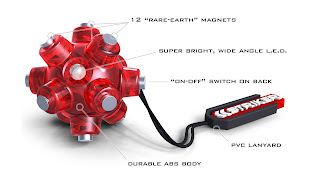 This Magnetic Light Mine is by far my favorite product. It's smaller than a golf ball, but is can attach almost anywhere to shed light to the exact spot it's needed. The uses for this little (but strong!) light are endless: on your embroidery hoop for sewing, working on an engine of a car, fixing a flat tire, plumbing under the sink, working on wiring behind your home theater system, attached to your sewing machine, working on dark electrical spaces... anywhere you can attach the magnets. The rare earth magnets are so strong, that they also serve as a "pick up" tool for dropped screws, staples & nails. The best part? It's only $6.99 so you can get 2 - one for your kitchen or craft area and one for the garage! Right now the guys at Striker are offering Kotori readers a 25% discount on all their products when you order on-line. Now through Father's Day. Just enter the code: Kotori at check out. *You can find some of these products at your Home Depot, Sears or Tru Value stores, the discount only applies to purchases from Striker's on-line store!